The Classic 40 Watt UV sterilizer is designed for maximum performance, power, and reliability. Ultraviolet is a proven dependable and effective method of controlling algae and harmful bacteria without leaving any residuals in the water. Aqua Ultraviolet utilizes the highest quality components designed to work perfectly together maximizing kill rates and insuring ease of installation and maintenance. Aqua UV Classic 40 watt UV Sterilizer WITH WIPER by Aqua Ultraviolet. The Classic 40 Watt UV sterilizer is designed for maximum performance, power, and reliability. Ultraviolet is a proven dependable and effective method of controlling algae and harmful bacteria without leaving any residuals in the water. We calculate and publish our flow rates at 30,000 µw/cm² , based on the end of that 14 month life so there is no need to adjust water flow. 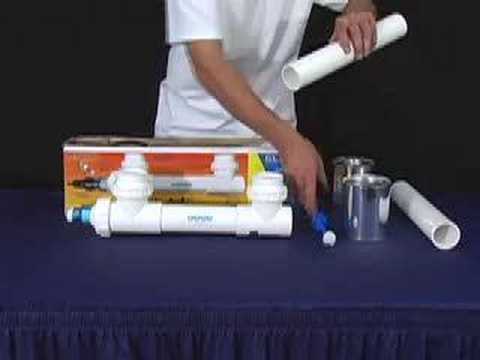 The Classic 40 watt UV is the premium choice for water sterilization of ponds/aquariums from 1200 to 2000 gallons eradicating bacteria and creating a healthy environment. The Aqua Ultraviolet Classic 40 Watt can also be used as a clarifier to remove free floating algae for bodies of water up to 3000 gallons with 50% to 75% plant coverage. Simply put Aqua Ultraviolet Classic 40 watt UV sterilizer will clear you water in 3 to 5 days, sometimes over night, and keep it that way. Dimensions: 38" X 4" X 2 1/2"